OneRepublic took the world by storm in 2007 with their debut release, Dreaming Out Loud. The album included the smash single “Apologize,” which shattered digital sales and airplay records worldwide, and, along with second single “Stop and Stare,” propelled the album to platinum-plus sales and a GRAMMY nomination for Best Pop Performance by a Duo or Group with Vocals. 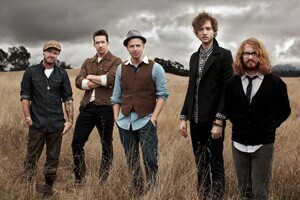 OneRepublic released its sophomore set, Waking Up, in 2009, and the band has seen three singles–“All The Right Moves,” “Secrets,” and “Good Life”—top the radio charts.